What It Is: I have a bunch of short-haul trips coming up this year, and my husband and I are trying our best to stick to carry-on only to save ourselves oodles of time (and money). All I have to say is? This amazing little kit would have been a perfect accompaniment to my last cross-country trek. It’s absolutely loaded with twelve products to keep your skin and hair looking healthy and lush – after all, what’s a trip without a few photo ops? 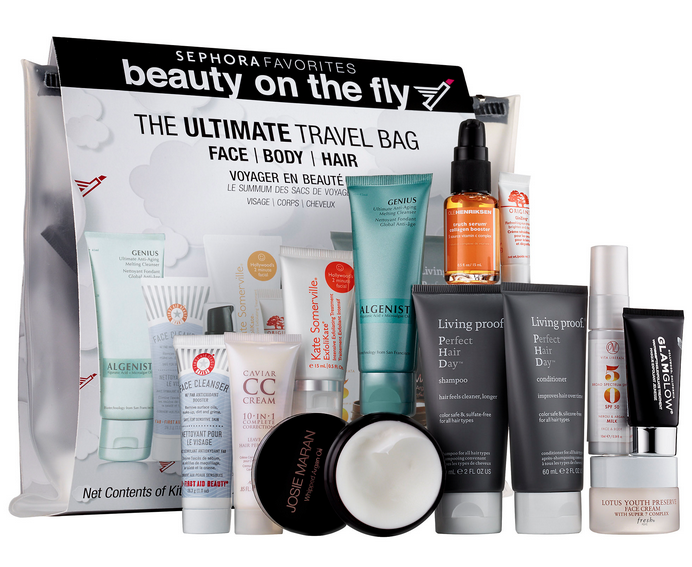 From shampoos and a cc cream for your hair to face masks and eye creams, it’s a perfect pick-me-up for post-flight fatigue. Plus, it comes in a clear travel bag that may pass the test when at security (although to be totally safe, you may want to stash the goods in one of the airport’s baggies) – simply top it up with any liquid makeup essentials and you’re ready to go fly girl! Who It’s For: The bride-to-be, to pack for her honeymoon. Your jetsetting parents, to haul on their summer vacation. Your commuting coworker, to make their cross-country trips a little less painful. Where It’s At: Sephora.ca and in stores. BONUS entry into yesterday Slobbers’ giveaway – tell me in the comments below, what do you think of this swell gift idea? I love this gift idea! Great for weekend getaways. With the new crackdown on carry-ons, I just don’t see how I can fit everything into something other than a full size suitcase. I think this is a swell gift idea indeed! I would like someone to gift me with this. This would be lovely. Don’t want to take any more then is needed on an airplane. This would be perfect for our weekends away- thanks so much! My husband and I travel on a motorcycle, this kit would be perfect for my limited packing space! I love this idea and would take it on my next trip if it weren’t so costly. It’s a great gift for anyone, but a traveller’s gift would be awesome. great idea for travel, also if you are wanting to try some new products. Perfect for all the summer travelling. it’s a nice idea! Very handy. I think it is just perfect for travelling. Slobbers’ bonus entry: I think this swell gift idea would be a nice surprise for anyone traveling. Hate when you arrive to your destination only to find out you left something at home. Great deal and a lovely gift for anyone. I like this gift idea although it would be great if you choose your own products. It is a great gift for anyone. I recently went on a trip and of course forgot a few things. The Beauty on the Fly would have been perfect and I would have looked and felt better.